More than 50 abortion clinics across the country have closed or stopped offering the procedure since a heavy wave of legislative attacks on providers began in 2010, according to The Huffington Post's nationwide survey of state health departments, abortion clinics and local abortion-focused advocacy groups. At least 54 abortion providers across 27 states have shut down or ended their abortion services in the past three years, and several more clinics are only still open because judges have temporarily blocked legislation that would make it difficult for them to continue to operate. Nebraska and Massachusetts have each added one clinic since 2010, and the other 21 states and the District of Columbia, most of which have not passed new anti-abortion laws since 2010, were unable to accurately count their clinics because their health departments do not license abortion providers separately from other kinds of medical providers. The Huffington Post's tally did not include hospitals that provide abortions. "This kind of change is incredibly dramatic," said Elizabeth Nash, state issues manager at the Guttmacher Institute, a reproductive health research organization. "What we've been seeing since 1982 was a slow decline, but this kind of change ... [is] so different from what's happened in the past." A comprehensive survey by The Daily Beast found that as of January 2013, 724 abortion clinics remained operational across the U.S. 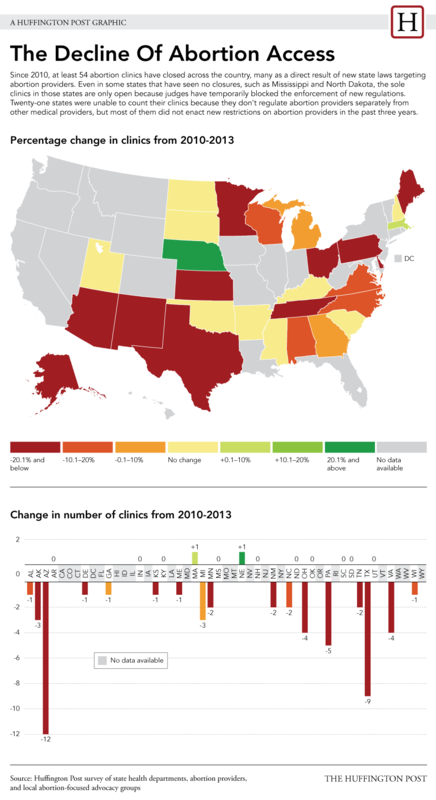 While some of the 54 closures were due to unrelated factors, the states that have lost the most clinics over the past three years are the same ones that have seen draconian new abortion restrictions and the biggest cuts to family planning funding. In Texas, which has lost nine clinics, lawmakers have slashed family planning funding in the state budget, required abortion clinics to become ambulatory surgical centers and required abortion doctors to have admitting privileges at a local hospital. Arizona lawmakers passed similar legislation and pushed out a total of 12 providers; the state had 18 abortion clinics in 2010 and now has only six, according to NARAL Pro-Choice Arizona. "This has turned into a nightmare," said Kat Sabine, executive director of NARAL's Arizona affiliate. "The kind of efforts the women have to take to get family planning or abortion services are just incredible, and you can only get care if you can get out of the community to do it. If you're on a reservation or rural part of the state, unless you have reliable transportation, you're not going to get care." In Lake Havusu, Ariz., there are several anti-abortion Crisis Pregnancy Centers and a Catholic charity hospital that does not offer abortion care, but women have to travel over 150 miles to either Phoenix or Las Vegas to find the nearest abortion or family planning clinic, Sabine said. The situation mirrors problems rural women face in other states. Mississippi, North Dakota and South Dakota have only one abortion clinic each, and the first two are hanging onto their only clinics pending court decisions. Other larger states, like Alaska and Texas, do not have nearly enough providers to respond to the needs of women in rural areas, because the clinics are concentrated in a few major cities. Compounding the problem, 26 states require women to wait at least 24 hours between their consultation sessions and abortion procedures, making it twice as difficult for rural and low-income women to access abortion care. "These restrictions have an uneven impact," Nash said. "Women who have resources, have a car, have some money in the bank, can access childcare and take time off work can obtain an abortion, and women who are less well-off and don't have those kinds of resources are not able to access abortion services." While states have been passing abortion restrictions since long before 2010, the recent legislative trend has been to directly target abortion providers and make it harder for them to operate. In addition to passing mandatory waiting periods and mandatory ultrasounds, states are passing so-called "TRAP" laws -- the Targeted Regulation of Abortion Providers. These laws often require abortion clinics to undergo extensive and costly renovations in order to become ambulatory surgical centers, which are essentially mini-hospitals. Anti-abortion advocates, meanwhile, argue that TRAP laws are designed to protect women's health by forcing clinics to widen their hallways, install specific ventilation systems and build locker rooms for physicians. Kristi Hamrick, a spokesperson for Americans United for Life, told HuffPost that the new restrictions are not the reason clinics are shutting down. "It was the choice of the abortion industry to locate their profitable abortion businesses in older buildings that would never pass muster for other outpatient surgical centers," she said. "It was their choice to ignore the laws of any given state on building requirements for outpatient medical facilities -- set by that state in line with a national standards board, not AUL -- and choose locations that were not as safe." Hamrick added that the fact that most of the available information on abortion clinic closures comes from the clinics themselves is evidence of the fact that states do not regulate the clinics enough. While some state health departments have specific licenses for abortion providers, states vary widely in how they count providers. Some only license ambulatory surgical centers that provide abortions, and others have no separate category for abortion providers, making it difficult to get an accurate count of how many providers there are without thumbing through the phone book. "While the abortion industry has claimed that their businesses have suffered, we have only their word on that," she said. The murder trial of Kermit Gosnell, the abortion provider in Pennsylvania who performed illegal, late-term abortions and allegedly "snipped" the spines of fetuses born alive, has fueled the drive to regulate abortion clinics even further. A group of House Republicans wrote letters to the health departments and attorneys general of all 50 states in May, citing the Gosnell trial and asking what exactly states are doing to "protect the civil rights of newborns and their mothers." RH Reality Check obtained 38 states' responses to that inquiry and published them. The publication's analysis of the documents concluded that abortion clinics in most states are aggressively regulated and extremely safe. "Most states said that they conduct regular inspections of abortion clinics, or of hospitals, ambulatory surgical centers, or other types of facilities where abortions can be carried out," RH Reality Check reported. "And most states said they were aware of very few — if any — incidents of patients being harmed as a result of an abortion." Still, Republicans at the state and federal level are proposing new ways to restrict abortion every time a legislative session begins, giving women in their states fewer and fewer options when faced with an unplanned or unhealthy pregnancy. "These restrictions do nothing to reduce the need for abortion or to reduce unintended pregnancy," Nash said. "I would say that those that are promoting these very burdensome clinic regulations have as an end goal the elimination of legal abortion. They don't have women's health in mind." Katie Burkhart and Danielle Schlanger contributed reporting. This article was updated to include data from Minnesota that was provided after publication. HuffPost readers: Have any clinics closed in your area? We'd like to hear from you. Send us a note at openreporting@huffingtonpost.com. Please let us know if you would like to remain anonymous. We will never publish your name or any identifying details without your permission.